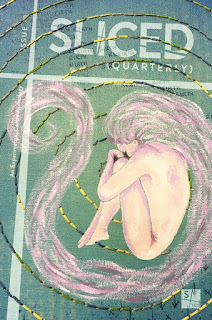 After two highly successful Kickstarter campaigns saw the publication of Volumes 1 & 2 of the experimental comics anthology over the last two years, editor Ken Reynolds is looking to do the same again just one more time as the quarterly magazine comes to a conclusion. Ken describes Sliced Quarterly as "a playground for creators to experiment with the comic book narrative and showcase simple, authentic, literary stories told in extraordinary ways, testing the traditional norms of the medium, and in so doing, elevating how they connect and communicate with the reader." 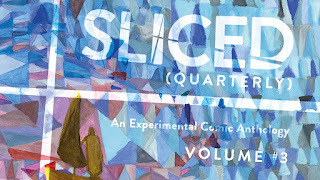 Each issue highlights the best and the brightest of cutting edge sequential narrative art in its ability to be insightful, emotive and provocative (see Steve's review of ISSUE #10) and the Sliced Quarterly Kickstarter campaign is now live, with the money raised being used to fund a print run of the final set of collected issues. Volume #3 will collect issues #9-12 (Volume #1 and #2 has issues #1-4 and #5-8 respectively) of the experimental comic anthology that have been published for the last year online as well as adding never-before-seen bonus material and comics not currently available in the website editions. The campaign is looking to raise £2,000 by the morning of Friday 8th February but, as always with Kickstarter, if they don't reach their goal in time, they don't get any of the money already pledged. So, what do you get in return for your money? All the current digital issues can be read and downloaded for free on their website at www.slicedquarterly.co.uk so you can try a sample of what's on offer before you decide to pledge (but remember that the print anthology will have a whole load of never-before-published material in it too) and you can support the Kickstarter campaign direct HERE.